If this is a sign of things to come, I, for one, am all for it, but there are implications which we are in danger of overlooking. 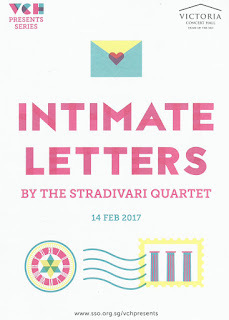 Yesterday I attended a recital given by the Stradivari Quartet. They performed two of Schumann’s quartet’s and Janáček’s Intimate Letters. I reviewed it for the Straits Times so if you are at all interested in my thoughts on their playing and programme, you can read it on their website. What my review does not mention was the matter which struck me most forcibly about their visual presentation. The first violin, Wang Xiaoming, appeared to be playing from a large number of photocopied sheets stuck together in a kind of concertina fashion which needed considerable reorganisation between movements. Nothing wrong in that at all; he can add his bowings and articulation markings without spoiling his original copy and this allows him the flexibility to change subtleties in performance according to the venue. I could not really see from where I was sitting (and it didn’t help that in the row in front was a particularly badly-behaved young boy), but I think he only used the one music stand – although I would not have been surprised had he used two. The second violin, Sebastian Bohren, played from a standard copy placed squarely on the music stand before him. He had prepared his page turns and between movements took the opportunity to check that all the necessary corners were turned up so they were within easy reach once the playing was underway. The cellist, Maja Weber, had an iPad on her music stand, and periodically stabbed at it and delivered a dramatic swipe to move the page along. So dramatic and aggressive were some of her swipes, that I wondered how she had trained herself not to push through several pages at once, but it all seemed to work well. Between movements she adjusted the placing of the iPad on the stand in that habit all musicians have in performance: you know the kind of thing which has pianists needlessly adjusting the stool between movements, singers clearing their throats between songs in case there might be an un-realised blockage, and orchestral players moving their music slightly to the left or right on the stand, all for no reason other than to expend a bit of pent-up nervous energy. The viola player, Lech Antonio Uszynski, played from a tiny tablet – possibly an iPad Mini – which he never once touched during the performance. Presumably he turned the pages by means of a foot pedal. This meant that he concentrated solely on the viola and when he was not playing or when there were breaks between movements, he sat patiently while all the others in their various ways re-adjusted their music. The issue of turning pages is a major concern. Pianists who use music often have to contend with page-turners who are never quite sure when to turn, and there is a sense that concentration is divided between playing the music and ensuring the page-turner is there and ready to turn at the right moment. Solo instrumentalists who need to use music – especially in new works – often have to spread it out across several stands to prevent the need for a page-turn, and I have even seen violinists use a page-turner out of necessity. For organists it is a particularly serious issue. Organists generally use music in performance both because it is the tradition, but more particularly because, with both hands and both feet fully occupied not only in playing notes but in managing stops, pistons, combination pedals, swell pedals, toe pistons and the like, there is far more which needs to be committed to memory than just the basic notes. On top of that, no two organs are in any way the same, and unless the organist only ever plays on the same organ, the music is necessary to keep the mind focussed when in an alien environment when stops, pistons, even numbers of keyboards, touch and resultant sound is so different from that to which they may have become accustomed. That organists do not need to have the music is evidenced from the growing numbers of concert organists who play from memory, but these are still the exception and most of us still rely on the music being there to keep us, musically, on the straight and narrow. For us, the problems are many: Which side does the page-tuner stand – it varies from organ to organ and even from piece to piece? Is the page-turner going to obstruct the sight of and access to the stops, located right where the page-turner’s armpit is usually poised (and several page turners either need to use under-arm deodorant or need to find a less offensive one)? And is the page turner’s leg to get in the way when there is a pedal or piston set over to the extreme edge of the pedalboard? Players have come up with a range of solutions. Dame Gillian Weir used to paste miniature copies of the music on a large sheet of hardboard, which negated the need for a page-turner but which hastened the need for a strong pair of magnifying spectacles. Others have spent many tiresome hours pasting hand-written staves and cutting out various bars from pages to make the page-turns possible by the player, while others abandon the whole idea of being in control of the organ, and simply play the notes while finding some mug of a page-turner who is willing to do everything else. I once turned for a Korean lady organist who expected me to pull out and push in the stops, operate the thumb and toe pistons and control the central swell pedal. So technology, if it can obviate some of these problems, is to be heartily welcomed. I have heard of, although not seen, organs where the music stand is in fact a large computer screen. You can scan the music into the computer and it will appear on the screen. Moreover, the technology allows it to roll on over each page without any human intervention. I have even seen music stands with built in screens on which the music can be read. There is the technology which allows the music to move along with the speed of the performance, and jump back where necessary with repeats and da capos. So the days of swiping iPad screens in performance are numbered, certainly. But are the days of music hard copies on stands also numbered? Not necessarily, for, as the Stradivari showed, there are implications. Forgetting, for a moment, the slightly distracting image of four players with four different kinds of music laid out before them (after all, this is a period if transition, so we cannot expect everything to be perfect every time), Uszynski unwittingly revealed the problem. What to do between movements? When musicians fiddle with their music, we know the performance is not over – they are clearly preparing for the next bit. Ridiculously, in this concert, the programme notes did not delineate the movements of the works, which meant the audience had no idea what to expect. So it was that, while Wang and Bohren made it clear that, when they were not playing, they were preparing to move by the simple act of rearranging their copies, Weber and Uszynski had no such means of communicating this to the audience. Weber did her little trick, but Uszynski simply sat there patiently looking at the others. If all four were using the iPad Mini system, what would we have made of the bits between movements? As a diploma examiner, I often commented on the failings of candidates to gauge the distance between movements; the common problem with young players is they rush between movements without sufficient space to allow the brain to change gear from one tonality or musical mood to another. Sometimes the gap between movements is dictated purely by the ease with which the page is turned – and I note players who get their page-turners to turn between movements often miss the essential spacing of movements; for my part I always insisted on turning my own pages between movements as it helped both me and the audience appreciate the change of mood within a single work. The implication of this new technology is that those who object to applause between movements (and I am not one of them) will have much more cause to be offended in the future. When we see four members of string quartet sitting silently doing nothing, we will inevitably want to fill that silence with applause, while those players who have traditionally spaced movements by the speed with which they re-adjust their copies, will find no need to break between movements at all, and we will get a spate of merged musical tonalities and moods which will in its own way disrupt the flow of the music. So roll on the new technology, but roll on the understanding that it does not always solve every problem without creating a few of its own.